Beaumont Traditional Sequential Exposed Thermostatic Valve with Rigid Riser kit from Ultra. These shower packs incorporate traditional shower valves with co-ordinating slide rails or fixed head kits. The complete shower package for any period style bathroom. 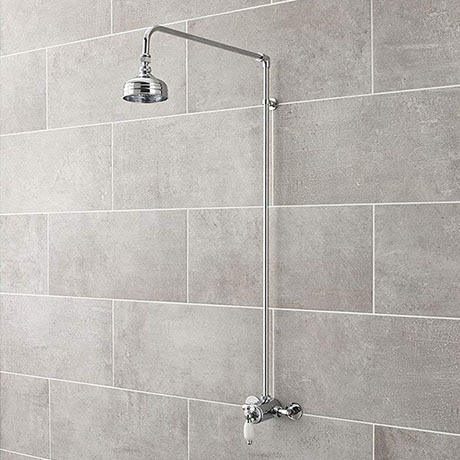 The traditional Beaumont shower rigid riser kit from Ultra is comprised of exposed pipework with a 4" Chrome Apron shower rose on an adjustable ball joint. Shower Head has a diameter of 4 inches. I am very pleased with products from your company. They have arrived in excellent condition. The delivery service was excellent.